Relationships with twin flames and soul mates are not normal relationships you encounter every day. When you have experienced one of these magical connections, nothing else will satisfy you. When we find ourselves in relationships with twin flames or soul mates, we experience the relationship on a very deep and spiritual level. 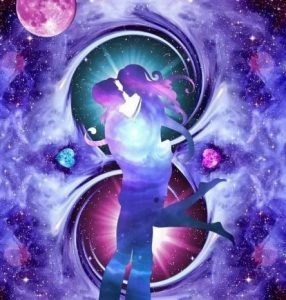 Soul mates and twin flames occur when we have a very strong etheric connection to another human being on the physical plane. Twin flames, as well as soul mates, are relationships that are very rare, but they do happen. Many people around the world are experiencing these relationships now, especially as we move into the Age of Aquarius. For those folks who have found their soul mate or twin flame life partner, the romantic aspects of the relationship can seem surreal at times. When both parties are engaged and the relationship is thriving, life is ecstatic, as you bond with that other human being who seems to be created from the same “star matter” as yourself. But there are times, for twin flames and soul mates, when the relationship can be challenging and frustrating. When you have not yet met the twin flames and soul mates who are to enter your lives, you might become anxious, frustrated or fearful that you will never meet the one person who can touch your soul in the way a romantic partnership with twin flames and soul mates can. You might see others in twin flame or soulmate relationships, or hear of friends and family members meeting twin flames or soul mates and wonder if God has forgotten you. We assure you this is most assuredly not the case. We are all individual and unique and we really have no control over when twin flames and soul mates enter our lives as this was something you decided with that other soul before being born. There is a certain destiny, or fate if you will, attached to twin flames and soul mates, as well as to the time you actually cross paths in your lifetimes. The best way to meet twin flames and soul mates is to continue to work on yourself, more so your spiritual self, and you individual karma. Twin flames and soul mates have been immortalized in romantic movies, novels and love stories. So many people spend too much precious time attempting to make the wrong relationships work. There is nothing wrong with hanging in there and doing all you can to make a relationship work, but if it is the wrong relationship, it will never work, no matter how hard you try, how much you cry or how deeply you pray. The right amount of work should be invested only in the right relationship. If you have been endlessly searching for a twin flame or soulmate, you might actually have clouded judgment, because they feel the need to find them right now. Instead of endlessly searching for ‘the one’, attaching unrealistic expectations on someone you fantasize is your twin flame or soulmate life partner or staying in a relationship that is no longer in your highest and best good, talk to us. You have come to the right place, and for the right reason. We have seen some people become so desperate to be in a twin flame or soul mate relationship they may mistakenly project onto a current, or past, romantic partner. They can become so attached to this individual that they will idealize the relationship because they want it so badly. If a romantic interest mistreats or breaks up with them, they may be so obsessed with this person, they convince themselves that so many obstacles have to be overcome to be together, because of the twin flame or soul mate connection. In reality, this relationship was not meant to last. For deeper and one-on-one insight and guidance into your twin flame or soul mate relationships, a psychic reading with Sarah Adelle and Sophia Elise will guide you in the right direction. Using their unique approach, and extensive experience in dealing with twin flame and soulmate questions and concerns from people around the world, they will get your relationship on track, or help you gain the courage to move on for good. Are You in the Soul Mate Friend Zone? Soul Mate Obsession: Do You Obsess Over Your Soul Mate? Has Your Soul Mate Hurt Your Feelings? Does Your Soul Mate Take Responsibility For Their Actions? Can You Get Over the Pain of Losing a Soul Mate? Have You Been Ghosted by Your Soul Mate? You may read the original content in the context in which it is published (at this web address). No other copying or use is permitted without written agreement from the author. If it’s Not a Twin Flame or Soul Mate Connection, What is it? Please be advised that not all predictions, readings or outcomes will be positive for everyone. You must be at least 18 years old to call Sarah or Sophia and understand you are ultimately responsible for your own decisions, choices and actions. We will provide guidance to assist you on your journey. The advice received from Sarah and Sophia is not a substitute for professional advice you would normally receive from a licensed professional. We do not answer questions concerning health or legal issues.